The invisible web is becoming visible - thank to projects like BBC Memoryshare! Today's internet is dominated by 'now'. 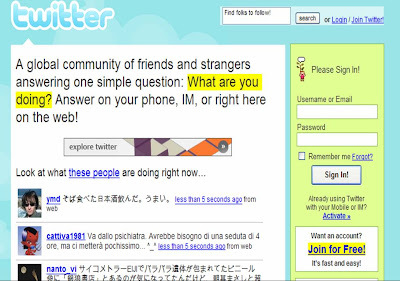 Facebook status updates (Nick is......), Twitter asking 'What Are You Doing?' - everything is about now or the future, but now the BBC are launching Memoryshare, a project encouraging people to share their past experiences online. 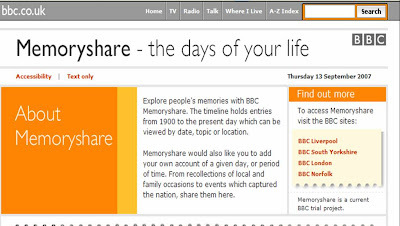 The user generated BBC Memoryshare project (reported in NMA on 6th Sep) is an interesting development as it will encourage users to upload previously inaccessible information into the public domain, enabling it to be viewed and searched online. There is common agreement that only a small percentage of human knowledge is available on the internet and moves to grow the amount of information online should be welcomed - after last years review it's good to see the BBC pioneering in this area. This is a massive project, will be promoted across the BBC networks and will hopefully bring a good deal of hidden information into the public domain. It will also become a valuable programme resource. The development of BBC Memoryshare reflects a growing trend where developers are creating applications that will help turn the ‘invisible web’ (the bank of human knowledge that currently can’t be publicly accessed from the internet) into the ‘visible web’. Thanks to Web 2.0 technology, video clips are being brought to life by You Tube and Facebook tagging is helping to resurrect old photos. Memoryshare will prompt people to look further back and will hopefully prevent information being lost to the course of time. 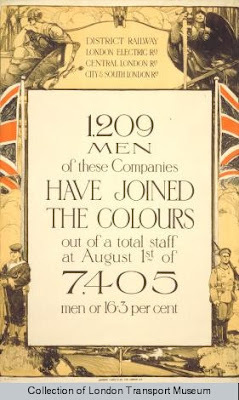 The Memoryshare announcement comes in the same week that the London Transport museum are publishing their archives of 5,000 historic posters onto the internet – publishing historical information could become the next big thing!